To me, churros are reminiscent of a good time. A sunny day, having fun with your friends kind of treat. I’ve never been sad with a churro in my hand. That fist bite of churro is like nothing else. They may look like squiggly doughnuts but that texture is something else, a crisp sugary shell hiding the silkiest, softest filling. They’re dangerously delicious and ridiculously easy to make, although I have no idea how people manage to make them perfectly straight. I kinda like the wiggly wormies I managed to fry up. The hardest part of this whole process is also the most fun. The squeeze and snip! If you’re not confident in doing this all yourself, drag in an accomplice. You squidge the dough over the hot oil (careful now) while your frying buddy snips the dough to form lovely little crispy delights. Giggling over the silly shapes you make is entirely optional. I highly recommend getting yourself a cooking thermometer for the frying process, it really takes the stress out of heating the oil and ensuring it maintains the correct temperature. Mine was a grand total of £2.50, treat yourself! That first bite of churro is like nothing else. They may look like squiggly doughnuts but that texture is something else, a crisp sugary shell hiding the silkiest, softest filling. 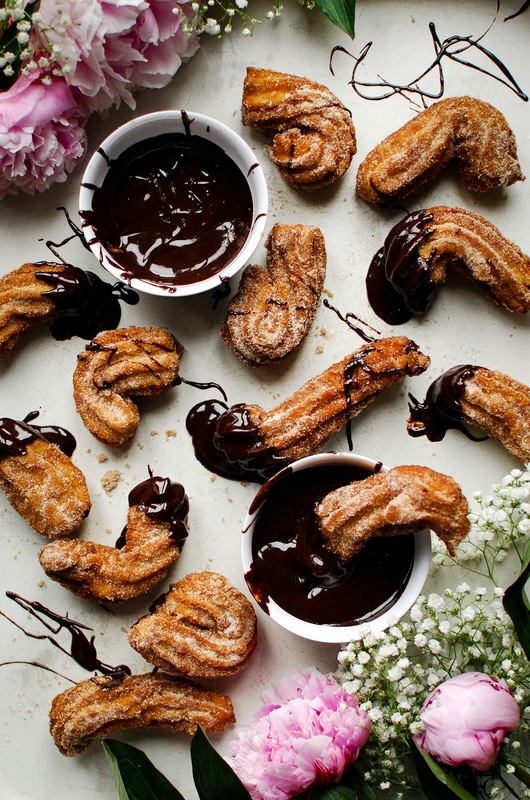 Start off by making the dough for your churros. Take 350ml of boiling water and add in the melted butter. In a large mixing bowl combine the flour and baking powder before slowly pouring in the water mixture, stir as your pour to make a smooth, lump free batter. Don’t be scared to give it a good beating, it can take it. Allow the dough to rest for 15 minutes. While your dough is resting, make the sauce. Take a medium, heavy bottomed saucepan and place all of the sauce ingredients in together. Melt over a low heat until you have a silky smooth sauce. Set aside. Back to the churros. Take a large, heavy bottomed sauce pan or I used a big cast iron casserole pan and fill half way with the sunflower oil. Place your thermometer on the side of the pan with the bottom in the oil and heat to around 375ºF/190ºC. 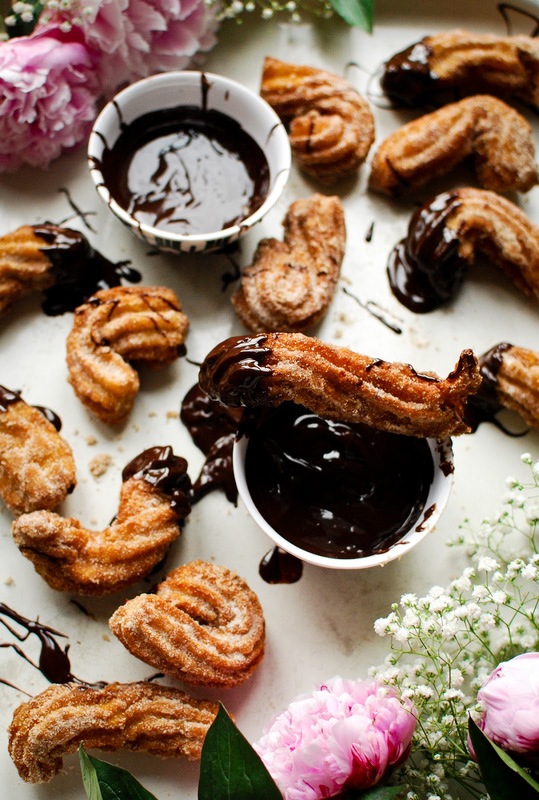 Mix your cinnamon and sugar together and pour onto a large baking tray ready for rolling your churros. Pop a large open star nozzle into a piping bag. Fill with the dough, then pipe 2-3 strips directly into the pan, snipping off each dough strip with a pair of kitchen scissors. Fry until golden brown and crisp. Be very careful while frying as hot oil can spit. 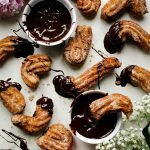 Remove the fried churros with a slotted spoon and drain on a tray lined with kitchen paper. Carry on cooking the rest of the dough in batches. 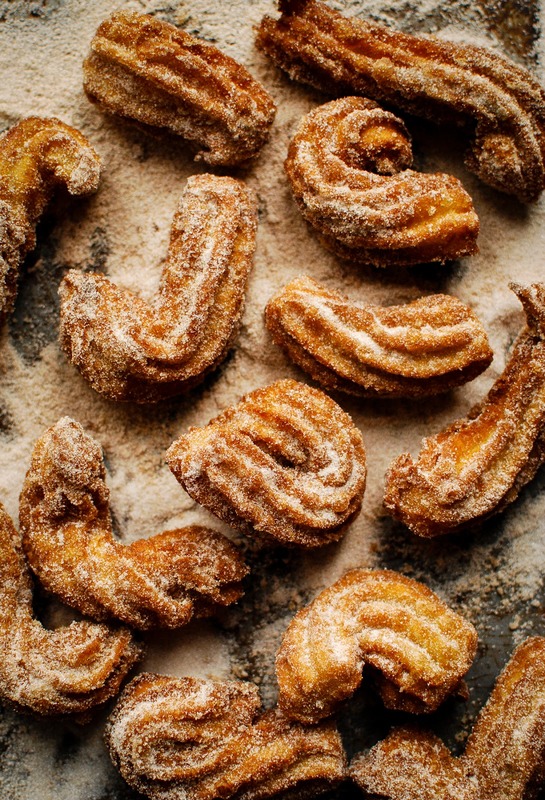 Transfer the fried churros into the cinnamon sugar and give them a shake, making sure they’re completely covered. Serve with the chocolate sauce, for dipping.